Pontypridd is a town in Glamorgan, Wales, in the county borough of Rhondda Cynon Taf. It has a population of roughly 33,000, and is situated 12 miles (19 km) north of the capital city of Wales, Cardiff . The “ridd” in Pontypridd is pronounced “reathe” (as in the word “breathe”). Pontypridd is often abbreviated “Ponty” by local residents. Pontypridd is a busy market town which is located at the confluence of the River Taf and River Rhondda rivers and at the junction of the Cardiff to Rhondda and Merthyr Railway lines. It is now part of the borough of Rhondda Cynon Taff, which includes The Rhondda, Cynon Valley and Llantrisant (one of the oldest towns in South Wales). Pontypridd is twinned with Nürtingen, South-West Germany. Pontypridd hosted the National Eisteddfod in 1893. 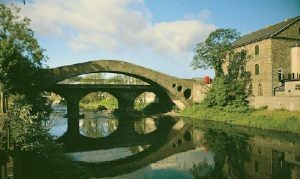 The name Pontypridd is from “Pont-y-ty-pridd” the Welsh for “bridge by the earthen house”, refers originally to a footbridge across the River Taff where the River Rhondda flowed into it, at the end of which used to be a primitive turf, or earth house. This bridge existed long before the town’s famous “Old Bridge “. The famous Pontypridd “Old Bridge” was built in 1756 by William Edwards (1719-89), a self-taught mason, from Groeswen near Caerphilly, who was a minister of religion by profession. Built in native stone, it was regarded at the time as an architectural feat because it was the longest stone-built single-arch bridge in Europe. Rising 35 feet (11 m) above the level of the river, the bridge is a perfect segment of a circle, the chord of which is 140 feet (43 m). Notable features are three holes of differing diameters through each end of the bridge. The purpose of these was to reduce the weight of the bridge, although their aesthetically pleasing nature is a bonus. Edwards was also responsible for building bridges at Usk, Pontardawe, Bettws, Dolauhirion, Wychtree, Aberafan, and Glasbury. Some of these bridges were similar in design to the bridge at Pontypridd, in that they consisted of one single span, but were not as steep. A plaque, designed by the sculptor W. Goscombe John, was erected in memory of William Edwards on the wall of his old chapel at Groeswen. Some time afterwards, Pontypridd became known as Newbridge after the bridge, and implying the existence of the old footbridge referred to earlier. The road bridge alongside, known as the Victoria bridge was built in 1857 as the Old Brige presented deifficulties due to itsd steepness of the design making it difficult to get carts across it. From the bridge looking up the river on the left is Craig-yr-Hesg headland, which once gave its name to another footbridge, built of timber, across the river known as Pont-yr-Hesg. Reference was made to the beauty of this headland centuries ago. Craigyr-Hesg quarry, famous for its blue pennant stone, is alongside. The history of Pontypridd is closely tied to the coal and iron industries. Sited as it is at the junction of the Rhondda and Taff valleys, it became an important location for the transportation of coal from the Rhondda and iron from Merthyr Tydfil, first via the Glamorganshire Canal and later via the Taff Vale Railway, to the ports at Cardiff and Barry. Because of its role in transporting coal cargo, its train platform was at one time the longest in the world. Tom Jones – Singer of such worldwide top 40 hits as Delilah and The Green Green Grass of Home, born in village of Trefforest. Sir Geraint Evans – World Class bass-baritone Opera Singer, born in nearby Hopkinstown. His father ran Côr Meibion Pontypridd.